I'm sure plenty of you already know this but I thought I would post it anyways. Can buy Idolm@ster SP DLC. There are two packs. 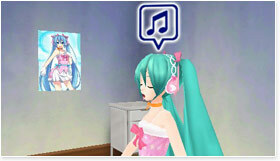 The first pack comes with "Hatsune Miku -Haruka Style-"
It also comes with a Miku rendition of "Go My Way"
Also included in the first pack is the "765 Window" Which goes in the Diva room. 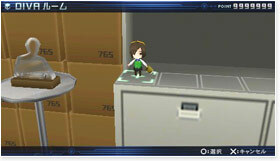 Other Diva room IM@S items are the "Crystal President" and "Meiko IM@S" Nendroid figure. A poster as well. This pack comes with a Rin and Luka version of "Relations"
If you own Project Diva - Extend - The costumes are available non DLC but the songs and items are not. 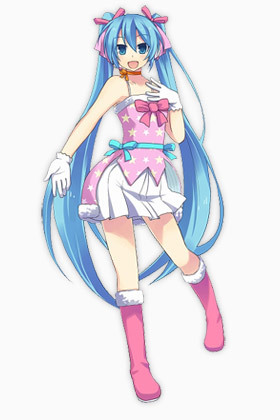 Luka Megurine - Chihaya Style. Available in "Shop" for 20,000 points after a hard clear of the song "Just Be Friends"
QUICK TRIVIA! : Rin wears two pigtails so she both Ami and Mami. Also The source voice for Rin/Len is Asami Shimoda who is the voice of the Futami twins. I didn't buy the DLC, but I obtained the outfits playing Extend. 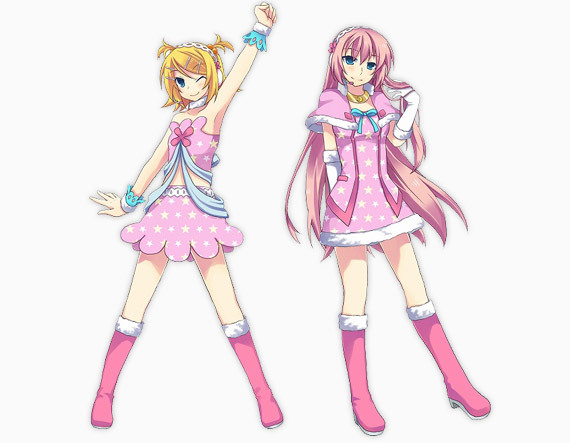 They're really cute, I love to pair Miku's Haruka Style with Rin's Ami/Mami Style in Colorful x Melody. I didn't know you could buy a Meiko Nendo dressed as Kotori! I need to save some money, then. I want them to make this happen! Played it till I almost broke my PSP buttons!